Addis Ababa, also spelled Addis Abeba, and the capital of Ethiopia and the African Union, is home to a population of roughly 4 million. The city's name originates from the Amharic word for "New Flower", reflecting its perceived status as a new flower for the continent. The city was founded by the Ethiopian emperor Menelik II in 1886. The site was chosen by his partner, Empress Taytu Betul. Bole Road has international crowds with a diversity of shopping and restaurants. Traditionally Ethiopian cuisine can be found alongside Mexican, Asian, and western restaurants. This area also has a lively night life. 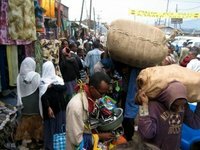 The Merkato claims to be the largest outdoor market in Africa. The market overflows into the adjoining streets and merchants sell their goods from stalls or on the sidewalk. Food, spices, good, crafts, and all most anything you can imagine are available in the Merkato. Roads become crowded with worshipers during Friday service so navigation can be difficult. The Merkato area is notorious for pickpockets so watch your belongings. Violent crime is almost nonexistent. This acclaimed film festival features both international and local movies, documentaries and shorts. It celebrates the growing African motion picture industry from May 14 through 19. An annual Easter race, athletes from all over the world come to compete and watch as cyclists complete 22 laps around the Addis Ababa Stadium. Two festivals in May that bring Ethiopia's culture center stage, you can expect outdoor film screenings, as well as a series of musical events and concerts that celebrate the wide variety of genres and styles that have emerged in the country. As Addis Ababa is located at around 2,400 metres above sea level, it rarely gets warm and temperatures can actually drop close to zero during the colder months. Temperatures rarely hit more than 30 °C though during the hotter days in summer. Temperatures average between 21 °C (July-August) to 25 °C (March-May) during the day, dropping to a rather chilly 5 °C (December) to 10 °C (April-August) at night. The rainy season lasts from late May to September, with July and August seeing much more rain than any other month, around 300 mm each month. October to January is fairly dry. Bole International Airport (ADD) is located near Addis Ababa and international flights to and from here with the national airline Ethiopian Airlines include destinations like Abidjan, Abuja, Accra, Asmara, Bahrain, Bamako, Bangkok, Beijing, Beirut, Brazzaville, Brussels, Bujumbura, Cairo, Conakry, Dakar, Dar es Salaam, Delhi, Djibouti, Douala, Dubai, Entebbe, Frankfurt, Guangzhou, Harare, Hong Kong, Johannesburg, Khartoum, Kigali, Kilimanjaro, Kinshasa, Lagos, Libreville, Lilongwe, Lomé, London, Luanda, Lubumbashi, Lusaka, Mombasa, Monrovia, Mumbai, Nairobi, N'Djamena, Ouagadougou, Paris, Rome, Riyadh, Stockholm, Tel Aviv, Washington, D.C. and Zanzibar. A number of other cities like Amsterdam (KLM), Sana'a (Yemenia), Istanbul (Turkish Airlines) and Jeddah (Saudi Arabian Airlines) have connections as well. Cairo, Dubai and Amman also have flights to Addis Ababa. Domestic services with Ethiopian Airlines include Arba Minch, Dire Dawa, Kabri Dar, Lalibela, Mekane Selam, Mek'ele, Mizan Teferi, Asosa, Axum and Bahir Dar, among a few others. The only train to and from Addis Ababa goes to and from Djibouti, via Dire Dawa and Harar. It is a long, slow and uncomfortable train link. Cars are available for hire from several major travel agencies. For guided tours with transportation provided check out Abeba Tours located in the Ras Hotel. Most tour companies provided a driver and/or English speaking guide, fuel, and insurance. These tours typically cost €80- 100 a day all inclusive. Public and private buses and minibuses run between major towns in Ethiopia. Most buses can be caught near the train station Addis Ababa. Travel times can vary depending on road conditions and traffic incidents. Bahir Dar- Travel to Bahir Dar can range from eight to ten hours by bus. Dessie- Dessie is approximately 12 hours from Addis Ababa by bus. Lalibela- Lalibela is a two day journey with a stop in Dessie by public bus. Selam Bus is a new upscale bus line connecting Addis Ababa with several major towns in the north. Prices are fixed and non-negotiable and service is convenient. Cake and drinks are provided on long distance journeys. Few people bother renting a car, other than expats who basically have their own car. It's neither necessary nor economical to travel around by car. If you insist, take a taxi or a car with a driver. Taxis are available for short and long distance travel. Blue public minibuses run several major routes and cost a few birr. Ticket collectors lean out the side door and call out the name of the minibus' destination while drivers pull slowly down the road. Simply flag a bus down when you hear your neighborhood. Walking in Addis Ababa is relatively safe and convenient. Many neighbourhoods are close together and major roads often have sidewalks. Ethiopian, western, and a diversity of other international restaurants are available in Ethiopia's capital. For traditional Ethiopian food check out one of the many cafes. Pastries and desserts are also readily available. Italian influence on the area has made spaghetti and pizza a staple for the area. China Bar And Restaurant - A high-end Chinese restaurant in Meskel Square. This restaurant provides traditional chinese dishes at a reasonable price. The entrees are good and desserts are great. Blue Tops Restaurant - In front of the National Museum in 5 kilo, 232463. This restaurant provides typical western food at a reasonable price. Restaurants in the Sheraton - High end Ethiopian and western restaurants at western prices check out the options at the Sheraton. The national drink of Ethiopia is 'tej', which is brewed from honey. You can also try 'tela' which is like a beer. Internet is slow and is better early in the morning or middle of the night. There are numerous internet cafes in Addis Ababa, Dire Dawa, Nazret, Bahir Dar, Gonder, Awasa and other cities; however their speeds are often dial-up at best, and some operate illegally. In Addis Ababa, connection speeds are more than adequate for performing tasks such as checking e-mail most of the time. Ethiopa's international telephone code is 251. For all travellers, having a mobile phone is a must. It is cheap and easily available. There are only a few stores renting SIM cards including ArifMobile. However, purchasing a SIM is inexpensive, and can be done anywhere that sells phones. The best spot is to buy it at a Ethio Telecom shop to not get ripped of. A SIM card costs 15 birr and the system requires the seller to take a photo of you and your passport information to activate your SIM. You'll have to sign an agreement that you will not commit any crimes with your phone. All local stores will have calling cards you can purchase to call internationally. For domestic calls, phones are topped up with a prepaid card, available in denominations of 2000, 500, 100, 50 and 25 birr and smaller. The Ethiopian postal service is one of the most efficient postal services in Africa. We have a comprehensive list of accommodation in Addis Ababa searchable right here on Travellerspoint. You can use our map to quickly compare budget, mid-range or top of the range accommodation in Addis Ababa and areas nearby. This is version 29. Last edited at 3:08 on Aug 2, 17 by sleepBot. 37 articles link to this page.